UACme is a compiled, C-based tool which contains a number of methods to defeat Windows User Account Control commonly known as UAC. It abuses the built-in Windows AutoElevate backdoor and contains 41 methods. The tool requires an Admin account with the Windows UAC set to default settings. Run executable from command line: akagi32 [Key] [Param] or akagi64 [Key] [Param]. First param is number of method to use, second is optional command (executable file name including full path) to run. 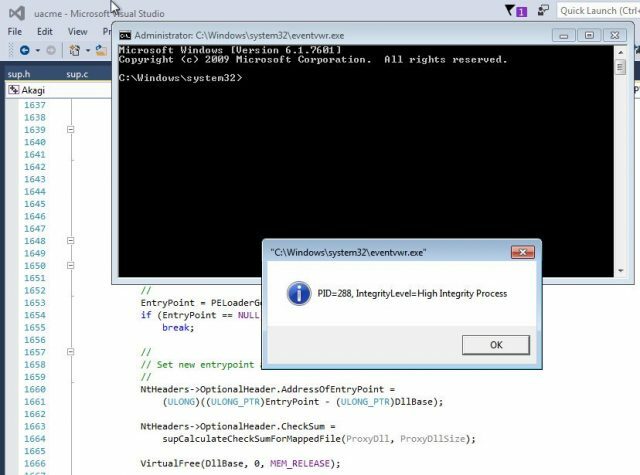 Second param can be empty – in this case program will execute elevated cmd.exe from system32 folder.